Charles Maxfield brings experience as a soldier and father to the classroom as he seeks resources for fellow veterans. 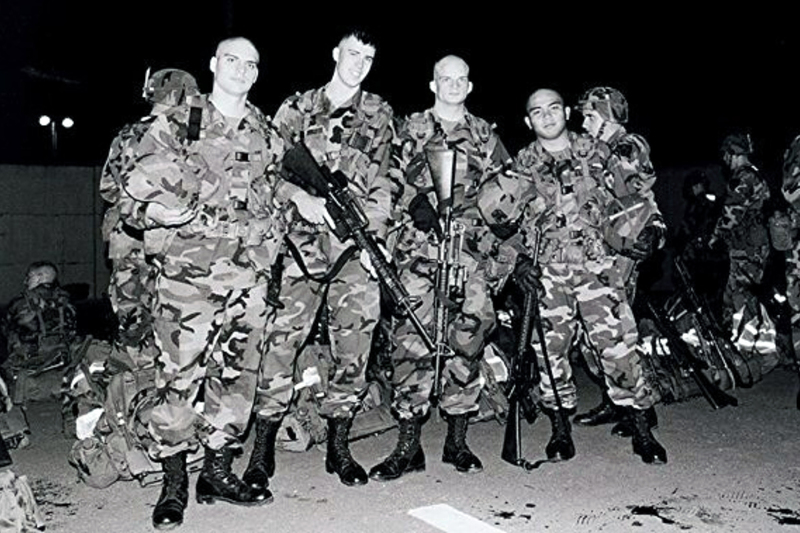 Charles “Chuck” Maxfield is on a routine patrol with fellow members of the 101st Airborne Division’s 2nd Battalion of the 502nd Infantry Regiment. It would be an easy day compared to most in Iraq – just a quick patrol, back inside the wire in plenty of time for a hot Thanksgiving dinner. The soldiers had looked forward to the meal for weeks, counting down the days until turkey and mashed potatoes would replace the MREs that often marked daily life during deployment. Over a decade later, Maxfield recounted the story to classmates in his first-term seminar course at Gustavus Adolphus College. The discussion prompt? Describe the worst day of your life. Then, Maxfield told his fellow students, the patrol stumbled upon a group of unidentified Iraqi corpses in a village on the outskirts of Baghdad. 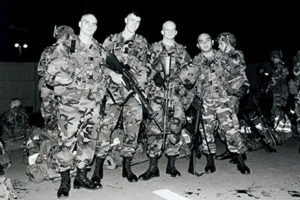 After arranging transportation, transferring custody of the remains to their Iraqi counterparts, and documenting events with the necessary paperwork, the weary squad returned to camp. The men dropped off their gear and headed to the mess hall, where they found out they had missed Thanksgiving dinner. “It was hard,” Maxfield told the class, explaining how much his team had looked forward to recapturing a sense of normalcy – of home – even if it was just for a couple hours. There were other bad days in Iraq, days when Maxfield wasn’t sure he’d make it back, but for some reason Thanksgiving stands out. After his fellow students – most of them a dozen years younger – left the room, the professor pulled Maxfield aside. She thanked him for his unique perspective and encouraged him to continue sharing his experiences in class. Growing up in Cleveland, Minnesota, population 700, Maxfield’s grades weren’t the best after his father passed away when he was 16. He enlisted in the army after graduating in 2002. “At the time, I had no idea what the world was like,” Maxfield recalls. After finishing basic training, he found himself deployed to South Korea with Bravo Company of the 2nd Infantry Division’s 1st/9th. A year later, he was assigned to the legendary 101st Airborne and earned his Air Assault Badge. 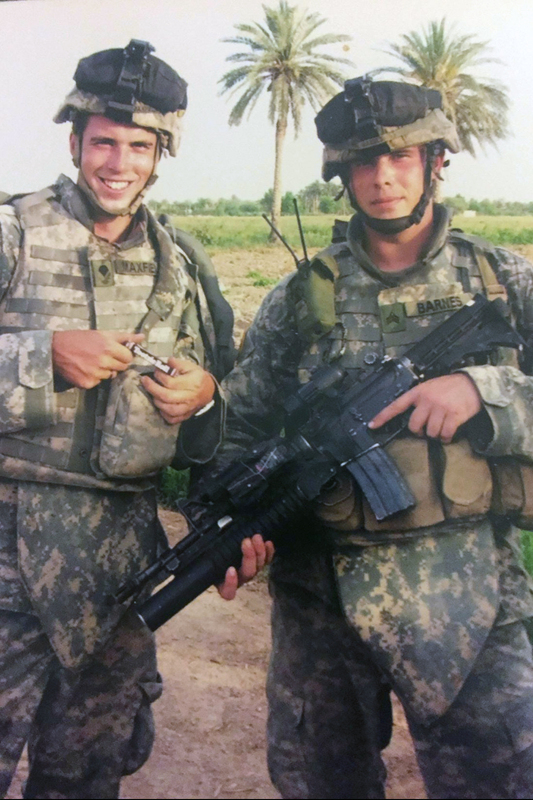 Maxfield (left) with a member of his unit in Iraq. Maxfield’s three-year enlistment was almost over and he was making plans for life as a civilian when word came down that his unit’s next deployment would be to Iraq. He turned it over and over in his head, but Maxfield couldn’t picture going home while his teammates went to a war zone. He signed up for an additional two years of service, knowing that it would put him in harm’s way. Operating out of Baghdad International Airport’s Camp Striker and Forward Operating Base Falcon, 13 kilometers south of the Green Zone, his team was responsible for security patrols and operational support during a period of growing tension and sectarian violence between Sunni and Shia factions. The team’s work could bring them away from base for days at a time, and Maxfield’s unit, the 2nd/502nd’s Delta Company, saw more action than most. “It was nothing at all or it was all at once,” the quiet veteran says before moving on to the next subject. After nearly six years in the military, most of it spent halfway around the world, Maxfield received an honorable discharge in the spring of 2007. Maxfield found his footing in the Saint Peter area. After working at the Nicollet County Sheriff’s Department and the Minnesota Security Hospital, he was hired by the Federal Bureau of Prisons in 2009 and assigned to the Federal Correctional Institution in Waseca. Eventually, he transferred to Aliceville, Alabama to help a new prison come online. The move was hard on his marriage and, after going through a divorce, he found himself back in Minnesota as a single parent with two children in tow. It was time to find a new routine. “I knew I had the G.I. Bill, so I started at Minnesota State University, Mankato in 2014,” Maxfield says. He made quick connections in MSU’s Veterans Club, which was working to create a Veterans Resource Center. When Maxfield came to Gustavus in 2016, he continued to work on the project. Maxfield (second from left) and his team in South Korea. 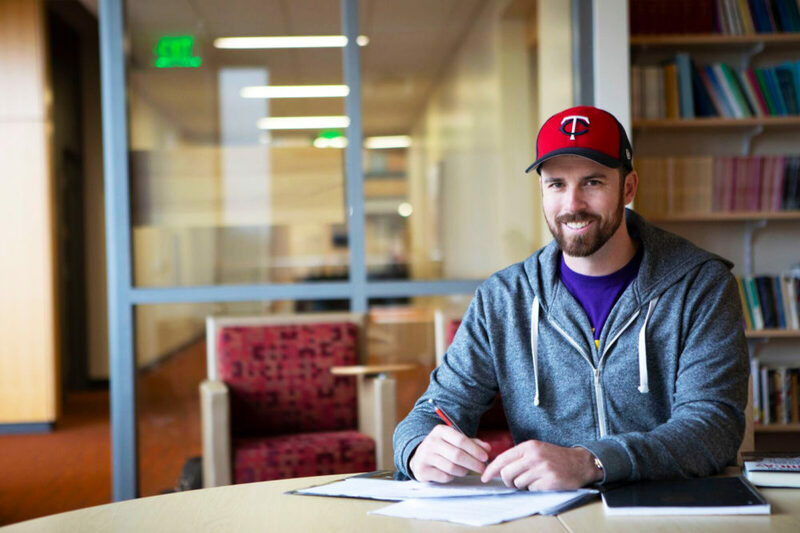 “I transferred to Gustavus because of the alumni network and mentoring, but I found out there weren’t many resources here for veterans,” he explains. But a Public Discourse class in the Department of Communication Studies gave him the opportunity to connect his passion for veterans services with his academic work. Two years later – with the class long completed and marked on his transcript – Maxfield is continuing to advocate for veterans both at Gustavus and beyond. In addition to exploring resources offered to veterans at other college campuses and developing ideas for Gustavus, he’s currently serving as an intern for Nicollet County Veterans Services. In a recent class discussion on barriers to voting and perceived inconveniences such as registering or standing in line, Maxfield helped clarify the issue for other students. “I saw Iraqi citizens walking 10 or 15 miles to vote for the first time in their lives,” he recalled. “They waited in line for hours and after they cast the ballot their fingers were dyed to show that they had voted.” Maxfield pointed out the immense risk the Iraqis took by walking around with a dyed finger in the days following the election, how the mark could make individuals a target depending on their religious or political affiliation. “I try to use those moments as opportunities to connect,” he says, explaining how his background helps him see things differently than his 20-year-old peers. But Maxfield downplays his contributions to class dialogue, instead focusing on his education as a means to serve others and provide for his family. Each morning, he drives the kids to school before going to his own classes. In the evening, they do homework together. And a couple hours later, when the girls are asleep, Maxfield finishes his reading and gets ready to do it all again tomorrow. His path began just six miles away in Cleveland, Minnesota, winding across the country and around the world before coming back to the Minnesota River Valley. His hands have held M-16s and prison bars, four young children, and college textbooks. Soon, they will hold a Gustavus diploma. As he gets ready for bed, Charles “Chuck” Maxfield looks out the window and across the street, where the black granite walls of the Saint Peter Veterans Memorial reflect the glow of passing headlights. Chuck, thank you for your service and sharing your story. I am a mother, wife, and niece of many veterans. And a Gustavus ’73 graduate. God bless you and your family. Chuck! What a neat article! Thank you for all that you do! I always knew you would come out on top. 🙂 Keep crushing it, brother! You’re a great American and a great Gustie, Chuck. God bless.